1. Defining an architecture for guiding a vehicle that works in a non-ideal environment and where working conditions may be changing. 2. Designing a monitoring system to avoid a deadlock situation in the performance of the vehicle when failures or unforeseen situations arise. 3. Integrating into the system the vehicle teleoperation, the automatic movements execution and certain autonomous behaviors, so that the operation mode can be switched depending on the operator decisions, the events occurring, etc. 4. 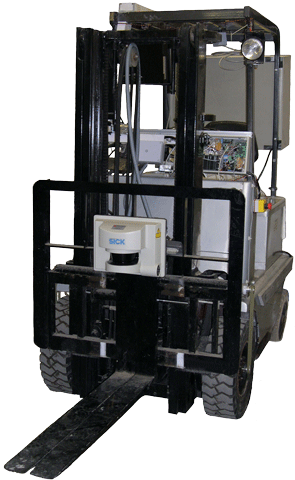 Building a prototype based on a forklift truck that can be used as a platform for experimental validation of the results of this project and that will let us incorporate new developments in order to achieve a greater degree of autonomy and security.